I found a new website called wire-wrappers.ning.com. Since I have the most fun with wire wrapping, this is my page. It looks like there are not a lot of members yet, but I especially love the Sma Bla page. Check it out - the jewelry is amazing. And oh by the way... we are snowed in - 8 inches already and we get another 8 tomorrow. And I have a terrible flu. Should be a good start to keep the bead soup simmering, no? I have a friend or two who would love this site since they are wire-wrappers! I'll be passing on the information. 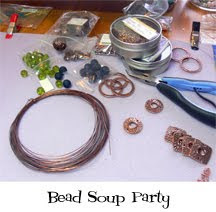 I'm really excited by the Bead Party--it's been a lot of fun! I can't wait to see what everyone created from their swapping!